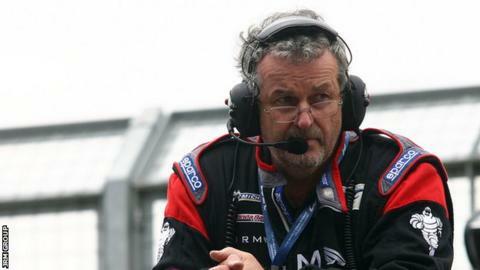 Nigel Stepney, the former Ferrari mechanic at the heart of the 2007 "spy-gate" scandal, has died in a road accident, aged 56. Stepney was sentenced in Italy to 20 months in prison after being found guilty of sabotage, industrial espionage and sporting fraud. He was run over by a lorry after stopping on the hard shoulder of the M20 in Kent and getting out of his van. The accident happened at about 01:30 BST on Friday, Kent Police said. "For reasons yet to be established, the man appears to have entered the carriageway and was then in collision with an articulated goods vehicle," police said in a statement. "He was pronounced deceased at the scene." Stepney had leaked nearly 800 pages of confidential Ferrari information to McLaren ahead of the 2007 season. He passed information to his friend Mike Coughlan, then McLaren's chief designer. Ferrari said they only found out when Coughlan's wife tried to make copies of the documents at a local shop, whose owner telephoned them to reveal his suspicions. McLaren were initially cleared of any wrongdoing, but after a second hearing by governing body the FIA were fined 100m euros and disqualified from the 2007 constructors' championship, which they otherwise would have won. McLaren drivers Lewis Hamilton and Fernando Alonso tied on points in the drivers' championship, one behind eventual winner Kimi Raikkonen of Ferrari. The team insist they never benefited from the information. Though Stepney did not serve his sentence, he never worked in Formula 1 again. The affair was reinvestigated by the FIA after Alonso threatened to reveal incriminating information during a row with team principal Ron Dennis over his treatment by McLaren. The Spaniard left the team at the end of the season, one year into a three-year contract. Stepney was also found guilty of trying to sabotage Raikkonen's car at the 2007 Monaco Grand Prix. He and Coughlan were initially banned from taking part in F1. Coughlan returned as Williams technical director in 2011, but left last summer. Stepney made a comeback to motorsport, running teams in the World Endurance Championship. JRM, for whom he worked in sportscars, said in a statement that Stepney had "a level of technical experience that was unrivalled". The team added: "Nigel was an intense and fierce competitor and always strived for excellence." Stepney had a long career in F1, starting at Shadow in 1977 before moving to Lotus, where he worked with the late Ayrton Senna, and then to Benetton and Ferrari, where he was chief mechanic and later technical manager in their dominant era with Michael Schumacher in the early 2000s. He fell out with Ferrari after he failed to get the job he desired in a reshuffle of the technical department following the departure of technical director Ross Brawn ahead of the 2007 season. He leaves his partner Ash and daughter Sabine.